This statement is a little crude since every textarea will auto-expand and we have not specified individual height limits. Therefore, we would probably need multiple statements for every page, e.g. To limit the textarea height between a certain range, we can add the minimum and maximum values to the “expand” name, e.g. Existing textarea tags will not auto-expand by default. 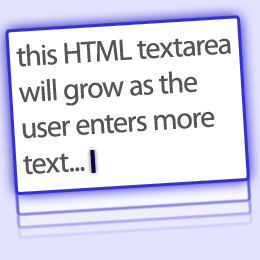 We can still use the jQuery TextAreaExpander() method when we need to, e.g. if a textarea is added to the DOM after the page has loaded. Progressive enhancement gives us a warm and cozy feeling! This loads the latest jQuery library (downloaded from jQuery.com) and our new TextAreaExpander plugin code.